Thought I’d share a bit about my own creative process since I spend so much time parked in front of a computer. The great thing about writing is that you can do it anywhere. Sometimes I’ll take my laptop to a coffee house or to the library, as a change of scene stirs things up and lets new ideas download into my fingertips. I often don’t know what’s going to happen until my fingers type it. My friend Kelly and I sometimes get together and write for a couple of hours at one of the Burgerville hamburger joints here in Portland. Mostly, though, I write at my desk. I honor my writer self—put flowers on my desk, and sometimes I light a scented candle. While I’m having my morning coffee infusion (which I can’t function without), I read over yesterday’s writing to get a run on where I am and what I want to do next. I use Scrivener. It’s a scene-based application for authors. I write from multiple points of view and it’s perfect for me. Because I’m a “pantser” instead of a “plotter,” my chapters and scenes end up needing to be rearranged, and it’s a lot easier in Scrivener than it was in Word. I keep two documents open, side by side. On the left is my main/real manuscript; the one on the right is for notes, where I type in new ideas for something several chapters ahead so I won’t lose them. I also use that “notes” document for rewording something I’m not happy with, which happens quite a bit. Then when I finally get it right, I paste it in. Having the two documents open at the same time somehow makes it less scary, because I have to admit, writing can be a very scary business. Sometimes I have no idea what to write or what comes next. When that happens, I grab a spiral notebook—I buy about 10 a year during the back-to-school sales. With notebook in hand along with my Waterman fountain pen, I sprawl on the sofa, music pounding in my ears, and free-write anything that comes to mind. Peeves I have, what the dogs are doing, what I want for my fictional characters, who by now don’t feel fictional at all and are as real as my friends. What I end up with is always a surprise—but that’s what makes writing fiction so much fun. Music drives my pen, or my fingers on the keyboard. I have iTunes playlists for every imaginable mood: Laibach for the dump trucks full of gun-toting cops in Isla Vista; Crosby, Stills, and Nash for Joel and me, the Beatles’ “Hey Jude” for my whole philosophy at the time… music puts me in whatever place I need to write about. How about you? I’d love to hear about how you write. 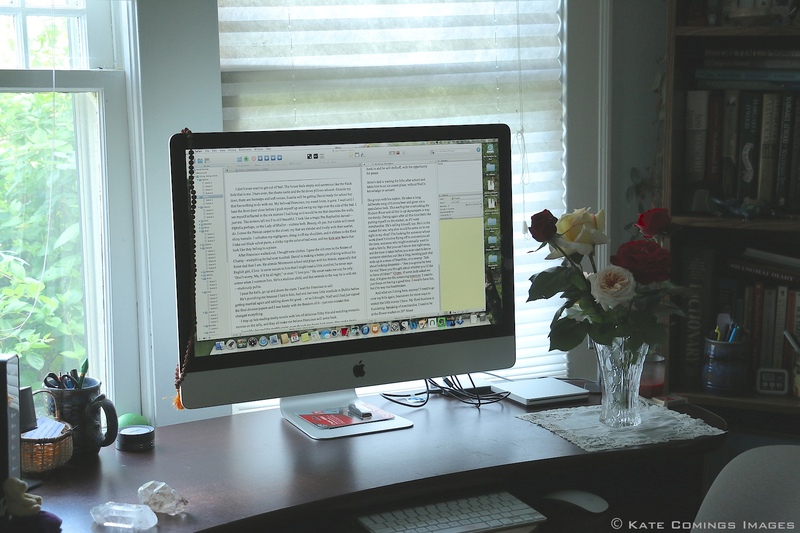 Tags: Authors, Fiction, Isla Vista, Scrivener, Writing, Writing process | Permalink. I love this topic! Thank you–your comment couldn’t have come at a better time. I am REALLY distracted right now. I’m in the process of getting “Playing in the Apocalypse” out in book form and am going over the proof for what feels like the hundredth time since I formatted it as an ebook. The thing is, I wrote that book 3 years ago and it’s not related to what I am currently writing, so it’s like doing 2 books at once. It’s terribly distracting, but a unique situation as I am a complete newbie when it comes to the scary process of actually getting a book out into the world. Along with the above, all the usual distractions apply. People call me. A lot of people I know have thorny problems and I listen–but sometimes I turn off my phone so I can write. I figure if it’s a crisis, they’ll leave a message. I have read about software that turns off email and Internet but I don’t use that, because I research a lot online while I’m writing on a computer. I stay away from anything not related to my book when I’m writing, though. I try to do email, Facebook, and Twitter (which I just recently started) while I’m still waking up in the morning, then after the coffee kicks in, I pull up my novel and read over what I wrote the day before, fix that, and start the day’s writing.